The Gut Microbiota — Is It a Novel Contributor to the Obesity and Diabetes Epidemics? Research shows strong associations between the types and amount of gut bacteria and these chronic conditions. The medical community continues to combat the obesity and type 2 diabetes epidemics—metabolic disorders that genetics and lifestyle behaviors are believed to cause. To continue the battle against these conditions, recent research has begun to aim at a new target: the intestinal microbiota. This article will review the literature on the gut microbiota and its role in obesity, insulin resistance, and type 2 diabetes, and discuss current methods for modulating the microflora, including nutrition and dietary modifications, that contribute to gut health. Management of diabetes involves controlling A1c, which assesses blood glucose control over the previous three months, blood pressure, and cholesterol levels. However, according to the National Institute of Diabetes and Digestive and Kidney Diseases, 47% of the 26 million people living with diabetes aren't meeting A1c goals, 49% have failed to control blood pressure, and 44% aren't meeting cholesterol treatment goals. Many medical experts believe that genetics and lifestyle behaviors cause obesity and type 2 diabetes. However, there's a growing body of research examining the role of the intestinal microbiota as a potential contributor to the diabetogenic era. "Over the past 20 years, obesity and diabetes have increased tremendously," said Meghan Jardine, MS, MBA, RD, LD, CDE, during a presentation titled "What Have Gut Bugs Got to Do With Diabetes and Obesity," at the American Association of Diabetes Educators' annual meeting in August. Jardine, who's the associate director of diabetes nutrition education for the Physicians Committee for Responsible Medicine, a Washington, D.C.-based nonprofit organization dedicated to promoting preventative medicine, said human genes haven't changed over the past 20 years, so that can't fully account for the obesity and diabetes epidemics. "Many scientists don't believe the changes in our diet and physical activity can [fully] account for the rising epidemic either," she said. "Scientists believe it's the gut bacteria—the microbiota—that have changed and play a role in obesity, obesity-related inflammation, and insulin resistance, which leads to type 2 diabetes." Other research suggests an interrelation between the different microbiota species that may work together for the benefit of the human body. Experts believe that a wide diversity of bacteria in the gut is beneficial. "We're just now starting to understand the role [the microbiota species] collectively play in our health, including diabetes, obesity, heart disease, and even cancer," says Kristi L. King, MPH, RDN, CNSC, LD, a senior pediatric dietitian at Texas Children's Hospital and spokesperson for the Academy of Nutrition and Dietetics. "Just as your kidneys are essential for creating urine, we're seeing how essential these bugs are for keeping us healthy. We know that without them, or [with] a significant imbalance, our health could suffer greatly." Many factors shape our microbiota as it evolves throughout our lives. "A baby's gut is sterile at birth, and the diversity of microbiota depends on how the child was delivered," Jardine said. "Vaginal birth compared to cesarean section results in more diverse microbiota. Infants who are breast-fed have a greater diversity of microbiota than those fed infant formula. Nutrition, genetics, antibiotic use, diabetes, and even our environment shape our microbiota." Chris Kafity, RN, BSN, a gastrointestinal nurse and administrator at Bay Area Gastroenterolgy in Norwalk, Ohio, and copresenter of "What Have Gut Bugs Got to Do With Diabetes and Obesity," agrees: "A healthy adult gut will have greater richness and diversity of bacterial species, and the host will exhibit better nutritional status, fewer comorbidities, and greater overall health." On the other hand, recent studies have found an association between diabetes and obesity and fewer but more specific bacterial species. "Obesity is associated with reduced microbiota diversity, a higher ratio of Firmicutes to Bacteroidetes, and depletion of Bifidobacteria," said Jardine, who attributes these changes to a high-fat diet. Basaran also found that bacterial counts related to certain metabolic variables. BMI and hemoglobin A1c influenced levels of Firmicutes, the most common gut bacteria species. Waist circumference and hemoglobin A1c was linked with levels of Bifidobacteria, a type of Actinobacteria; and both weight and fasting blood glucose was associated with Clostridium leptum counts.4 "Further studies should be carried out to elucidate if the gut microbial changes are a cause or effect of metabolic diseases," Basaran said in a press release. Basaran and other scientists believe that manipulation of the gut microbiota could offer a new approach in the management of obesity and type 2 diabetes.6 Three modulators of gut microbiota—prebiotics, probiotics, and synbiotics—continue to garner interest as novel therapeutic agents. The benefits of a high-fiber diet that includes whole grains, vegetables, fruits, and legumes are well established. As research on fibers with prebiotic properties continues, they can be recommended as part of daily fiber intake; however, it's important to encourage consumption of fiber from a variety of sources. Probiotics are live bacteria that are either the same as or similar to the bacteria found naturally in the human body and may be beneficial to health. They're often referred to as "good bacteria" or "helpful bacteria." The Food and Agriculture Organization and the World Health Organization define probiotic bacteria as "live micro-organisms which, when administered in adequate amounts, confer a health benefit on the host." 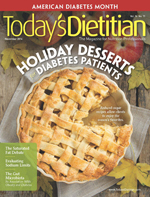 In another double-blinded, placebo-controlled, randomized trial, females with type 2 diabetes given 100 mL of a shake containing Lactobacillus acidophilus, Bifidobacterium bifidum, and fructooligosaccharides twice daily exhibited a reduction in blood glucose levels.8 The shake in this study contained both probiotic bacteria and prebiotic saccharides, forming a synbiotic. A synbiotic is formed when a probiotic and prebiotic are combined. Studies have shown that every probiotic benefits from a select number of carbohydrates. When prebiotics are selected based on their ability to stimulate the growth of the probiotic part, the effects of the probiotic are enhanced. Many products sitting on store shelves carry the label "probiotic," but all too often they don't meet qualifying criteria for probiotics, such as defined contents, viability at the end of shelf life, and evidence of health benefits. In an expert consensus document published in June 2014, the International Scientific Association for Probiotics and Prebiotics recommended that the term "probiotic" be used only on those products that actually deliver live microorganisms with suitable viable counts of specific strains with an expectation of delivering health benefits. Since there's no evidence of a health benefit associated with fermented foods the panel also recommends that these foods be kept outside the probiotic framework. "We still have a ways to go in gut microbiota research, but what we've seen so far is quite interesting and promising in all aspects of health," King says. "As we learn more about the gut microbiota, we'll be able to individually tailor diets to help minimize or prevent symptoms of chronic disease." In the meantime, nutrition intervention strategies should emphasize healthful plant-based eating patterns that include fermented foods such as yogurt, kefir, buttermilk, sourdough bread, and kimchee. 1. Trust for America's Health. F as in Fat: How Obesity Threatens America's Future 2012. http://healthyamericans.org/report/100/. Accessed September 14, 2014. 2. Everard A, Cani PD. Diabetes, obesity and gut microbiota. Best Pract Res Clin Gastroenterol. 2013;27(1):73-83. 3. Owyang C, Wu GD. The gut microbiome in health and disease. Gastroenterology. 2014;146(6):1433-1436. 4. Gut microbe levels are linked to type 2 diabetes and obesity. Endocrine Society website. https://www.endocrine.org/news-room/current-press-releases/gut-microbe-levels-are-linked-to-type-2-diabetes-and-obesity. Accessed September 14, 2014. 5. Binns N. International Life Sciences Institute. Probiotics, Prebiotics and the Gut Microbiota. http://www.ilsi.org/Europe/Publications/Prebiotics-Probiotics.pdf. Accessed September 14, 2014. 6. Kootte RS, Vrieze A, Holleman F, et al. The therapeutic potential of manipulating gut microbiota in obesity and type 2 diabetes mellitus. Diabetes Obes Metab. 2012:14(2):112-120. 7. Kolida S, Gibson GR. Prebiotic capacity of inulin-type fructans. J Nutr. 2007;137(11):2503S-2506S. 8. Gomes AC, Bueno AA, de Souza RGM, Mota JP. Gut microbiota, probiotics and diabetes. Nutrition Journal. 2014;13:60.